Cosmic Chi Kung booklet builds on the healing aspects of the Universal Healing Tao foundation practices. The student will learn how to use the Cosmic Chi Kung in combination with color and hand techniques for guiding the healing process in yourself and others. You will make use of your Personal Stars and connections with the Big Dipper and North Star so as to have the Chi to "sweep and clean out" sick energies. In Cosmic Chi Kung Master Mantak Chia to bring the ancient, time tested wisdom of the Universal Healing Tao System to the Western world. Cosmic Chi Kung presents a whole new understanding and approach to healing with detailed explanations of self-healing techniques and ways to transform negative sick energies. Learn to develop your most powerful healing potential through Cosmic Chi Kung combined with your Mind, Eyes, Heart and intention. 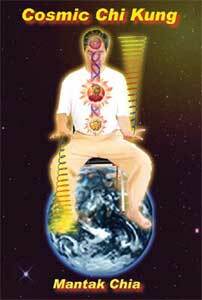 Cosmic Chi Kung encourages your Compassion to support other in healing themselves.